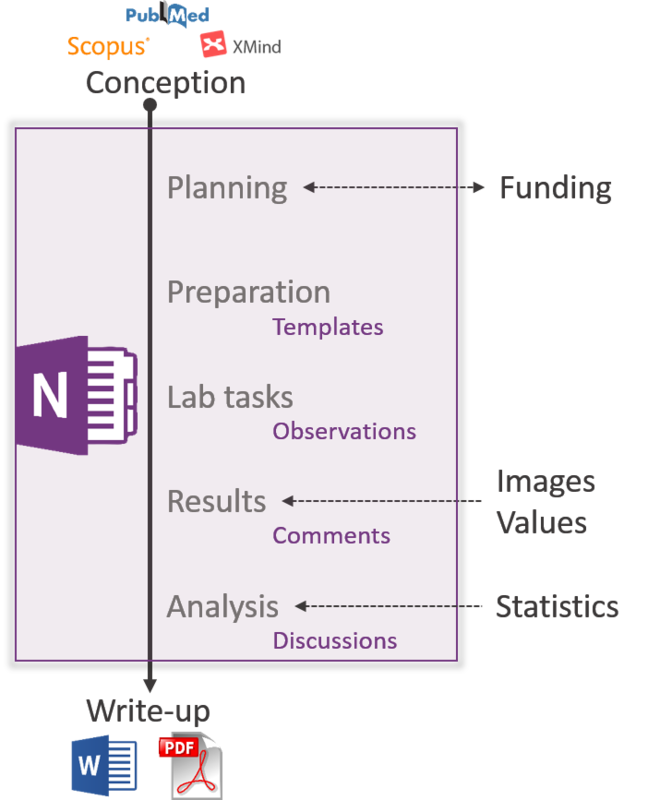 Using Microsoft onenote as your lab book leaves you in control of your content with full offline access while remaining flexible about devices, location and integrations, but consider the intellectual property and data storage requirements of your organisation. When I started my first lab project as a research student/assistant at NeuroSearch I received an A5-sized notebook with the instruction to write all and every experiment detail, idea and thought process into it. After diligently filling dozen of pages I found myself spending increasingly more time looking for something I had written before and, new to the entire process of conducting experiments, adding details to previously filled pages. This started to become annoying and inefficient so I looked around for electronic lab notebook (ELN) alternatives. The electronic option needed to fulfil the traditional & policy requirements and make full use of a modern laboratory work environment. New web based ELN alternatives have entered (and some already left) the market and I have tried almost all of them. Connected Researchers keeps an updated list of most current options and while some initially appeared very useful (e.g. sciNote, LabGuru and elabftw), none of them addressed my concerns convincingly: no full offline functionality nor full access to my files & entries. If I sit in a conference room with hundreds of people clogging the Wifi or I’m writing a paper on while travelling, I want the option of full read & write access to all my notes. Onenote syncronises them the next time I’m online, but it works offline exactly as well as online. Onenote has, of course, evolved since I started using it, with the most useful new features being the full integration of excel spreadsheets in 2013 and the availability across different devices. Just keep in mind that the Mac, iOS, Android and Blackberry versions are not able to open local/network stored notebooks, and can only work with notebooks stored on microsoft servers (at no cost). Over the last years, a few researchers have written about their ELN options, onenote and others, and I suggest to have a look at their examples for ideas and inspirations and what will fit best into your daily work. 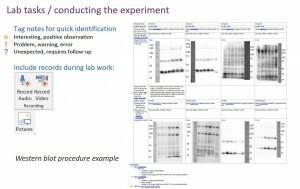 The Postdoc experience; Gradhacker; The Lab-o-Mator; ASCB (good usage tips for onenote); Penn State; Bitesize bio (make sure to read the comments too). Also, Thomas Maurer has written an excellent up-to-date overview of the wide range of onenote functions: This is why Onenote is awsome. 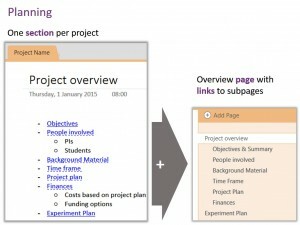 And don’t hesitate to get in touch if you have questions, ideas or would like some advice on how to adopt onenote as ELN for you (including templates). I am interested in integrating a similarly structured ELN for the lab I currently work in. Would you be able to provide me with a template to reference? – Time/date stamps. Easy to use, easy to modify which means it requires a lot of effort for me to prove something in court (i.e. for patent issues). – IBM/Lotus Notes : A lot of people will hate me for mentioning this but the Journal database is wonderful. It is not free form, but very easy to use, just like any word processor. Easy to categorize and tag items and you can even cross-reference your emails if you use Notes for that as well. In addition, it will take massive attachements and capable of indexing within PDF’s and Word documents. This means I can drag all my research papers right into the database and it acts like a full-text search of all the papers I’ve got on hand. It also means that I can copy the entire file onto USB stick for backup very easily. Everything, logbook and copies of all papers. You can get really fancy with a Domino server and have everything online, but even without a server, it’s easy to turn on the web page functionality and access the notebook from another computer within your network via browser. The Notes database has been proven over many decades. All entries automatically has create/modified time stamps that you cannot easily modify and you can even turn on logging which will log WHO did WHAT and WHEN to the entries. Thanks for your valuable comment! Completely agree with the time/date stamp issue of OneNote, it would unlikely hold up as a prove in court. I do an index reset once a year, it’s certainly helps. Your suggestion of IBM Notes is certainly interesting and sounds like covering pretty much all ELN needs, but not being readily available for anyone will remain a hurdle. I introduced OneNote to our lab to use as an ELN (moving away from paper) but the issue is the timestamp would likely not hold up in court, as stated above. DO you know a work around or if there is a macro or anything like that where the time can be stamped but not altered, maybe unless the page was deleted? Just curious. Thanks much! Thanks for the question Brandon. I am only aware of one reliable solution for this problem, explained here: http://lab-o-mator.blogspot.com/2015/06/a-flexible-electronic-lab-notebook-eln.html (using the timestamp options available for PDFs). It might be worth considering whether the unmodifiable timestamp is an essential feature for you. For instance the “first-inventor-to-file” system would not need such a feature. 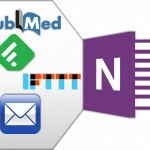 I am currently working on transitioning one of our labs to OneNote as a temporary ELN. On the whole, it seems very flexible and my initial users seem pleased. 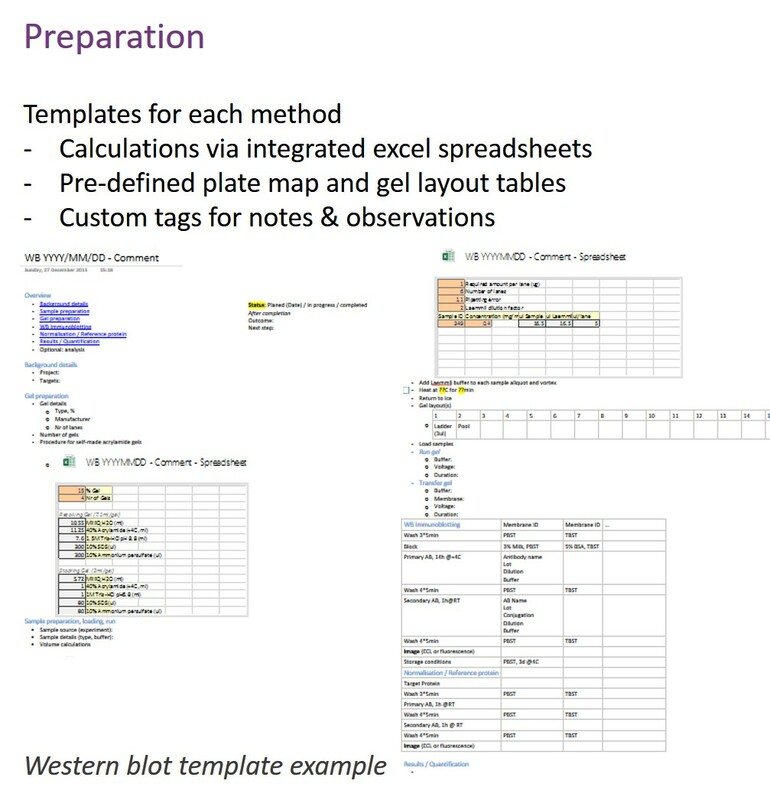 One thing they have brought up time and again is that they are not able to sync embedded spreadsheets in OneNote. We create a page and insert or attach a spreadsheet with calculations at our desks. We will then go to the lab and use an iPad to take notes. If we did need to edit a spreadsheet, those changes are not visible face up in OneNote and isn’t visible at all on the Desktop version. Have you encountered anything like this and what was your workaround? To my knowledge, the feature of editing excel files and synchronizing these edits within OneNote currently only exists in the full windows version. The free Windows version, the Android and iOS can only open the embedded files, but not save edits in them. 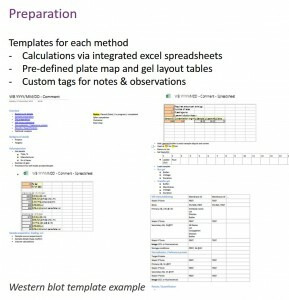 (See others with the same problem: https://answers.microsoft.com/en-us/msoffice/forum/msoffice_onenote-mso_imobile-msoversion_other/onenote-with-attached-excel-spreadsheet-using-an/897fa166-3f4a-43e6-8caa-659a0bee9d52) There have been hints that future versions of the free editions will have this feature, but for now it doesn’t exist. Pretty frustrating and the main reason we use Windows devices in the lab. RE workaround: once you open the excel spreadsheet on the ipad, save it in a Dropbox/OneDrive/Box/… synchronized folder so you can open it again at your desk. 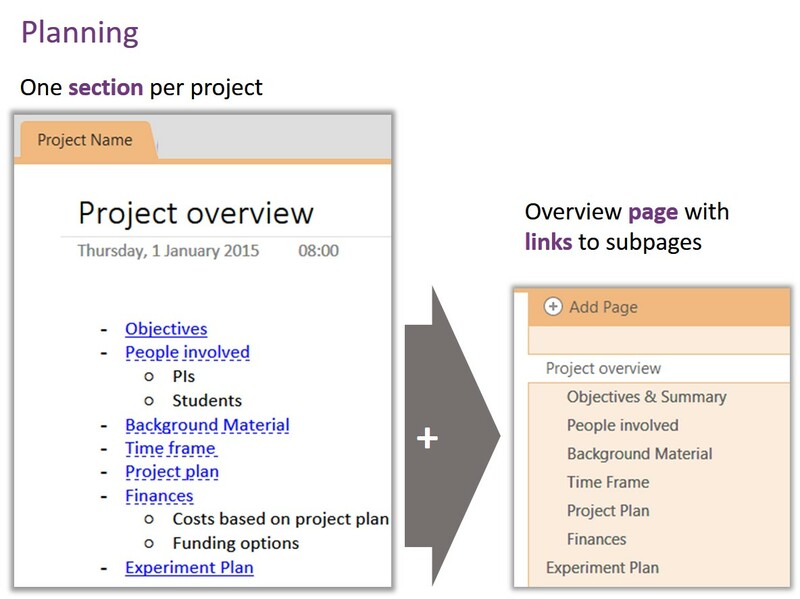 I set up OneNote to use as an ELN in our labs with your templates, everyone loved it, brilliant. Microsoft did an update. Export to PDF function now no longer exists in the Windows version! That was the only way for us to make it meet the regulations was to do a monthly export, sign and lock. Have you come across this problem? Is there a way around it? Unfortunately the only workaround I know of is to print, and select a PDF printing option. This will remove any codes from internal links, but at least you still get a PDF version. Hope this helps!